Music Costs > How Much Does Refretting a Guitar Cost? How Much Does Refretting a Guitar Cost? The condition of your guitar frets will determine how well the guitar play, and every time the strings are pressed against the frets, the friction changes the shape, causing them to wear out over time, showing dents or flattened frets. As this time goes on, this contact can lead to a string rattle or intonation issues. Since the process is time-consuming, the costs can be high but worth it. With so many variables, the costs can depend on the professional doing the job, the amount of work that has to be done, what the guitar is made from and geographical location. Also, the type of fingerboard and upgrading the nuts can add to the price. For example, working with maple will cost more than working with a rosewood. The same can be said with the strings since stainless steel frets are known to be more expensive to fit. 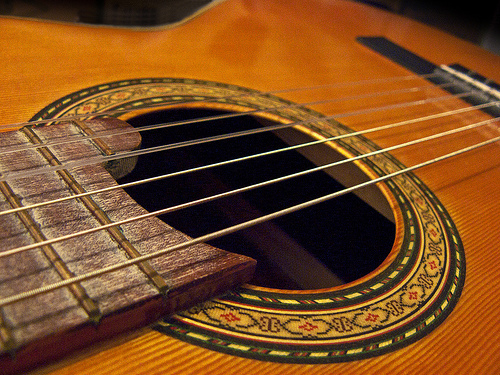 “Strings” (CC BY 2.0) by Angel T.
How much does a re-fret cost? On average, re-fretting a guitar neck can cost from as little as $75 to as much as $500. Some professionals, for example, may charge per fret rather than per job. If the expert charges per fret, it can start at $10, but if the professional charges by the hour, be prepared to pay anywhere from $35 to $90 per hour depending on the reputation. Refer to our table below to see what averages we had found when we visited popular music repair shops websites located in the United States. For example, one member chimed in on this AcousticGuitarForum.com thread and said the typically re-fret with a bound fretboard and no raised binding can cost about $250 for a Les Paul. Per fret $100 to $150 for one, but add $10 to $25 per additional fret during same job. During the process, the guitar will be completely disassembled and the old frets will be removed. Once removed, the fret slots will be cleaned and the new frets will be installed, followed by leveling, a re-crown and polish. Refer to the video below to see how the process works. The repair quote should include the fingerboard plan, a slot clean, level, crown and assembly after the refretting. Upgrading the fret wire could be an additional $20 to $35. For instance, Third Coast Guitar charges an additional $25 for stainless steel or an EVO gold fret wire. If the guitar has other cracks or breaks, this will be an extra cost to consider. The price for repairing is often charged by the hour and can cost anywhere from $50 to $80 per hour. Vintage or antique guitars can cost more due to the time that will take to restore them. If the nuts have to be replaced as well, this can be considered an additional expense. Older guitars can have nuts that tend to wear out faster. Reputable guitar experts in your local hometown can charge more due to the demand. If having an older guitar done, it may be ideal to pay more to ensure that the job is done properly. You will know you need a re-fret if the frets are flattened, the strings are buzzing, the wear shows dents or there are problems with intonation and playability. If the complete fret has to be replaced and the expert is charging less than $75, you may want to second-guess their work. It is best to get a before and after picture as well as ask for references to ensure this person does quality work. Before hiring a professional, ask them about their experience. How long have they been doing it? What makes them good at their job? If you have a vintage guitar, ask them how they work with antique guitars. If you purchased the guitar for less than $100 and you do not have any attachment to it, you may want to practice or learn on your own. While it does take some skill to learn, it can help you save money in the future. A fret dress, which is commonly done with a setup, may be able to solve your problems. I went to the String Shop in Murfreesboro, this shop is great. I had the first five fretts replaced &a some frettboard repair on my J200 JR &a a complete refrett on my Les Paul. My guitars are like brand new again. The Les paul is a 1999 the J200 JR is a 1992. He will restring & buff a guitar $40.00 Each. I will get that next. I recently had a fret job done on a 20+ years old Jackson Fusion that I had bought used. It turned out that the previous owner(s) had taken such bad care of it for the last 20 or more years that the frets (esp. 19-24 on the low B string) have become pretty worn down. The person who did it also included a setup/intonation job with it, which was probably necessary too given that little-to-no maintainence had been done on it by previous owner(s). I got a 1957 Acoustic Gretsch as a gift . I had 3 at one time 5 years someone broke in and Stole a Chet Atkins 1960 country gentlemen. they stole a lot Insurance payed 1/4 of what they were worth.